I came across this old recipe in an email to my dad from about two years ago! I’m terrible, I scribble down or write in emails to myself dozens of different recipes when I’m planning to bake something, then I just throw my favourite ingredients together and don’t take any note of what I’ve done! I remember with this recipe I was writing an article, so I had to take note of what I was doing (although the only record still seems to be in an email to my dad!). I was searching for the best basic baked cheesecake recipe, as the idea was that a basic cheesecake is a really simple desert to make, and can be made to look quite impressive with just a few simple additions – hence the name! And all you do is crush the biscuits, add the cocoa, stir in the melted butter and press into your lined and greased 20cm springform pan, then refrigerate! If your base is too dry just add a little more butter – it won’t hurt! Preheat your oven to 180°C/350° F/Gas Mark 4. Beat the cream cheese until smooth, then add the sour cream, vanilla and sugar. Stir in the flour, and your done! Pour the filling onto your cooled base and bake for 40 minutes, or until just set – the cake should still wobble slightly in the middle. Turn your oven off, but leave your cheesecake inside to cool with the door ajar. 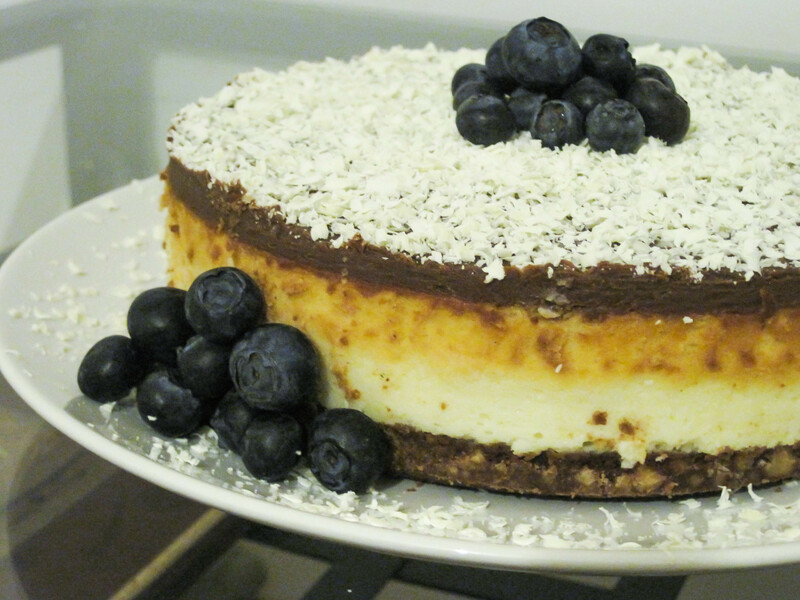 For the cheesecake pictured, I made a milk chocolate ganache to smooth across the top, then garnished with grated white chocolate and fresh blueberries. Top with whipped cream and a little crème fraîche for extra tang, then garnish with a fresh berry compote. Top with a spiced rum and orange zest whipped cream, then garnish with candied orange and cinnamon sticks.